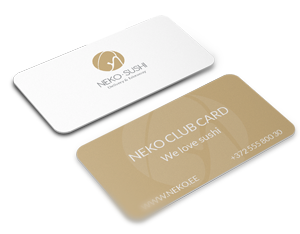 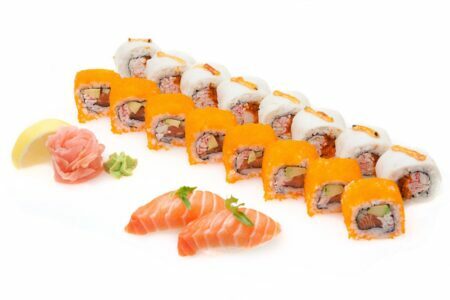 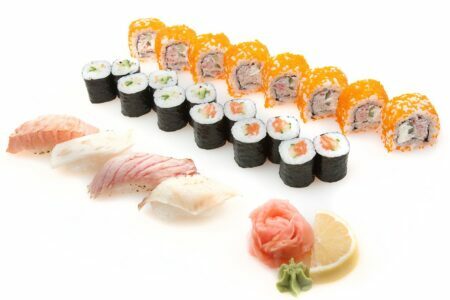 Nr.260 Sushi set 1 19.50 € Alaska Maki 8pcs (cucumber; snow crab; salmon); Maki Stereo 8pcs (baked butterfish; snow crab; masago; unagi sauce; sesame seeds); 2 Salmon Sushi. 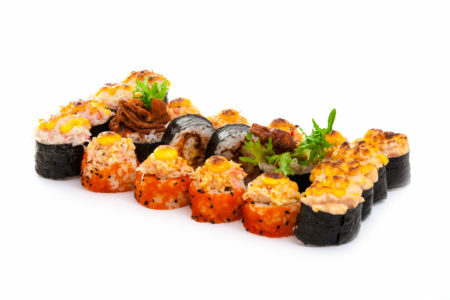 Nr.261 Sushi set 2 19.50 € Philadelphia Maki 8pcs (salmon; cream cheese; cucumber; sesame seeds); Maki Teide 8pcs (snow crab; salmon; masago sauce; unagi sauce; sesame seeds); 2 Prawn Sushi. 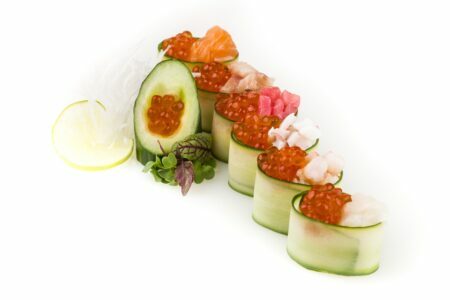 Nr.262 Sushi set 3 19.50 € Megami maki 8pcs (snow crab; cucumber; cream cheese; flying fish roe); Cucumber maki; Sake kapa maki; 4 Baked sushi: salmon; tuna; butterfish; red snapper. 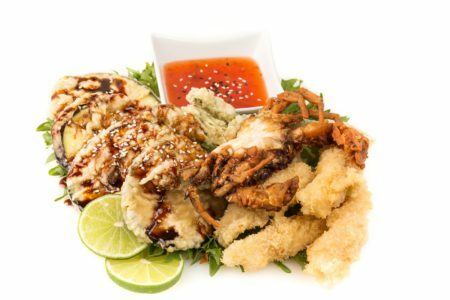 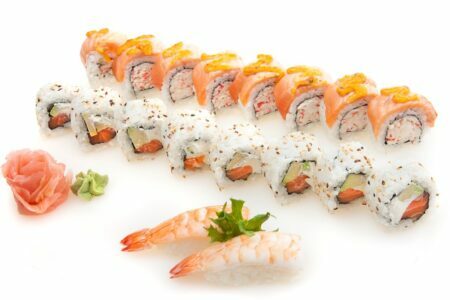 Nr.263 Sushi set 4 29.50 € Kagawa 4pcs (Soft-shell crab; flying fish roa; frillice salad); Hotchick 8pcs (baked; flying fish roa; salmon; snow crab; hot sauce; unagi sauce); 4 baked snow crab sushi; 4 baked salmon sushi. 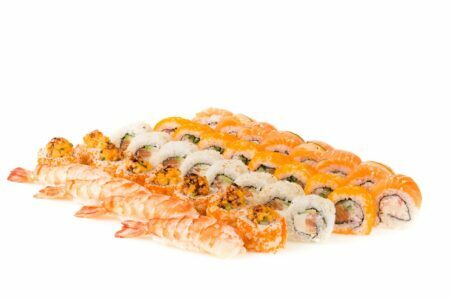 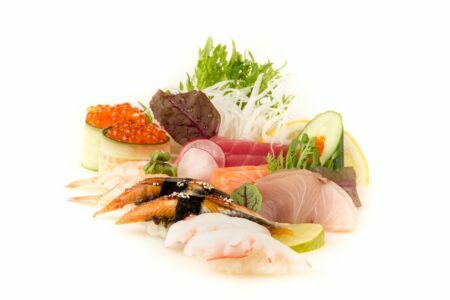 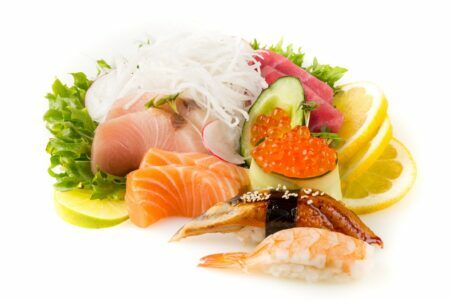 Nr.264 Sushi set 5 43.50 € Fudzijama 8pcs; Alaska 8tk; Philadelphia 8tk; Okinawa 8tk; 4 king prawn sushi..
Nr.265 Sushi & sashimi set 18 € Salmon sashimi 2pcs; yellowtail sashimi 2pcs; tuna sashimi 2pcs; sushi with salmon roe 1pc; sushi with prawn 1pc; sushi with eel 1pc..
Nr.266 Sushi & sashimi set for two 28 € Salmon sashimi 2pcs; yellowtail sashimi 2pcs; tuna sashimi 2pcs; sushi with salmon roe 2pcs; sushi with prawn 2pcs; sushi with eel 2pcs; sushi with octopus 2pcs..
Nr.600 Ikura gunkan set 6pcs 16 € cucumber, king prawn, octopus, salmon, salmon roe, scallop, tuna, yellowtail.